As per the National Organization of Rare Disorders, Evans Syndrome is a rare disorder in which the body’s immune system produces antibodies that mistakenly destroy red blood cells, platelets and sometimes certain white blood cell known as neutrophils. This leads to abnormally low levels of these blood cells in the body (cytopenia). The premature destruction of red blood cells (hemolysis) is known as autoimmune hemolytic anemia or AIHA. Thrombocytopenia refers to low levels of platelets (idiopathic thrombocytopenia purpura, or ITP, in this instance). Neutropenia refers to low levels of certain white blood cells known as neutrophils. Evans Syndrome is defined as the association of AIHA along with ITP; neutropenia occurs less often. In some cases, autoimmune destruction of these blood cells occurs at the same time (simultaneously); in most cases, one condition develops first before another condition develops later on (sequentially). The symptoms and severity of Evans syndrome can vary greatly from one person to another. Evans syndrome can potentially cause severe, life-threatening complications. Evans syndrome may occur by itself as a primary (idiopathic) disorder or in association with other autoimmune disorders or lymphoproliferative disorders as a secondary disorder. (Lymphoproliferative disorders are characterized by the overproduction of white blood cells.) The distinction between primary and secondary Evans syndrome is important as it can influence treatment. Evans Syndrome is a diagnosis of exclusion. Doctors will test for a plethora of illnesses before diagnosing a patient with Evans Syndrome. Doctors will do a CBC which will tell them your complete blood count and a Coombs test which identifies the cause of anemia. Mortality rate - Evans Syndrome has a mortality rate of 7% after 3 years. 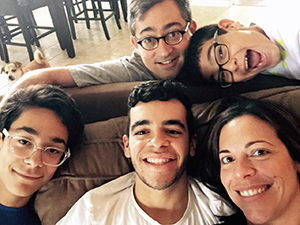 In 2013, our family's world was turned upside down when our 14-year-old was diagnosed with Evans Syndrome. We were thrown into a world of "We don't know" and "let's try this and if that doesn't work, we'll try that" and "this is very rare and there is very little that's known about it". It is unacceptable that we don't know enough about Evans Syndrome. It is unacceptable to put patients through trial and error drugs, that can have major side effects and wreak further havoc on their bodies, because there is no other course of treatment. It is unacceptable that there is no awareness at all regarding Evans Syndrome. It is unacceptable that there is no research specific to Evans Syndrome. The Evans Syndrome Foundation will strive to change all this. The Evans Syndrome Foundation will create awareness, and hopes to fund research specific to Evans Syndrome. The Evans Syndrome Foundation has been created as an effort to educate Evans Syndrome patients, their care givers and the general public. The Foundation funds research for better treatment of Evans Syndrome.